For some tattoo enthusiasts, choosing wedding rings is an easy task: they get wedding ring tattoos. This popular trend has people getting ink on their ring finger in many different styles. As the 20th century drew to a close, many couples started searching for more unique styles of wedding jewelry. Some choose to design their own rings in gold or platinum, having them designed and inscribed with symbols that meant something in their relationship. Others choose to get inked on their left ring finger. Some couples might choose a simple design as a 'place holder' until they later purchase the actual rings. Wedding ring tats can encompass a wide range of styles and designs that are limited only by your creativity and imagination. In addition to coming up with the design itself, make sure you also give consideration to the shape, size and color of the ring. While many wedding ring tats are black work, you can bring additional attention to the area by getting yours inked in color. Consider using two colors within a Celtic knot to symbolize your joining with another, or create a realistic looking ring with a gold "band" and colored "stone" on the top. There are two popular methods of sizing your wedding tats to consider as well. One method is having both rings be identical in both size and shape. Another is having the rings be of different sizes or shapes. It is not uncommon for the husband's traditional wedding ring to be larger, heavier or plainer than the wife's; it is entirely possible to recreate this effect with wedding tattoos as well. Choose a more delicate or intricate version for your tat, while using a more simple or enlarged version for your husbands. Size the overall tattoo as you would a ring; don't make it any larger or smaller than you would ordinarily feel comfortable wearing or drawing attention to. While the idea of an indelible symbol of your love and fidelity may seem irresistible, it's important to note that your ring tattoo may not come out exactly as you would like. As with any hand tattoo, the process of healing on a finger can mean that your wedding ring tattoo may become distorted or blurry. Additionally, these tattoos can take a while to heal, because your fingers are in constant use. It's important to practice good tattoo aftercare, and choosing a less intricate wedding band design may also be a good idea. Keep in mind as well that like any hand or finger tattoo, it is more likely to fade over time. Frequent touch-ups are often needed to keep your tattoo looking its best. Perhaps the most famous wedding ring tattoos belong to Pamela Anderson and Tommy Lee. Pamela got a tattoo on her left ring finger that read "Tommy" and Tommy received one that stated "Pamela". When the couple divorced, Pamela had her ring ink modified into a tattoo that reads "Mommy". 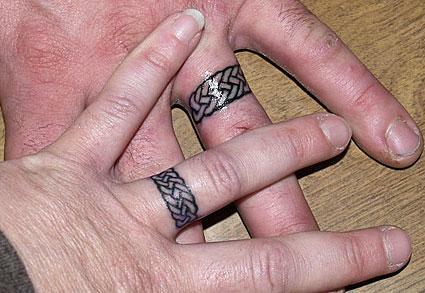 Other couples soon followed the Pamela and Tommy lead, and this can be seen as the beginning of the explosive popularity of wedding ring tats. Comedienne Kathy Griffin also had a wedding ring tat, but had hers removed with a laser after her five year marriage dissolved. These tattoos have become so popular that they are even mentioned in song: the artist Ben Folds has a song entitled "You to Thank" that talks about getting matching "tattoos that look like rings". Wedding ring tats are frequently inked for numerous reasons, from wanting a unique expression of love to what is meant to be a temporary symbol of commitment until traditional rings can be purchased. No matter what the reason is behind your desire to get inked on your ring finger, make sure the design is personal and meaningful to you both.